Confections E Juice is a premium vapor by coastal clouds company. Confection E Juice is Another tasteful E liquid offered by Coastal Cloud Company. Maple butter flavor is unique and great. Lets Vape & Smoke Shop KC is the only Head Shop in Kansas City offer a big variety of E Juice and huge selection of flavors. Why go to the candy store, when you can get all the rich and creamy buttery flavor in this premium e-juice? 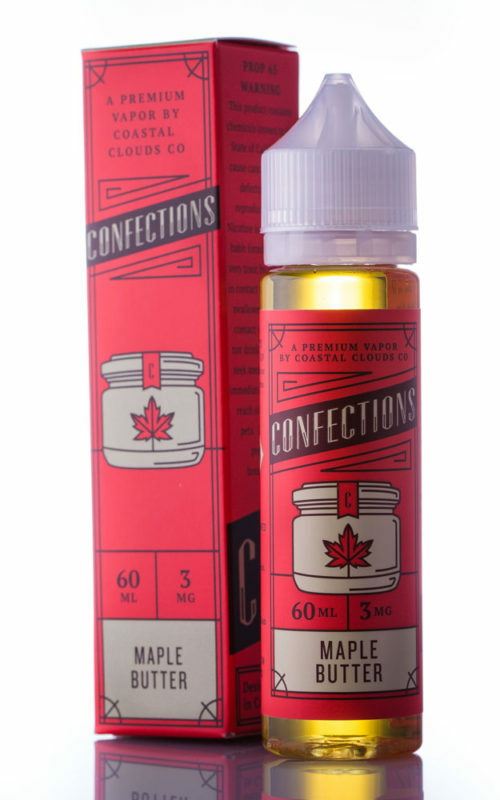 This confectioner’s blend of straight-from-the-spout maple syrup and buttery goodness is the perfect combination of salty and sweet and it’s all yours to enjoy and for a best smoking experience. So how sweet will you go? We’ve got both 30mL and 60mL bottles for you to choose from. And you can order your bottle just how you like it with 0mg, 3mg or 6mg nicotine levels. Like what you taste?